Depending on your point of view, leeches are either benevolent medical wonders capable of fantastic healing, or creepy, bloodsucking creatures. Regardless of how you view the leech, this relative of the humble earthworm has a fascinating array of physical features. 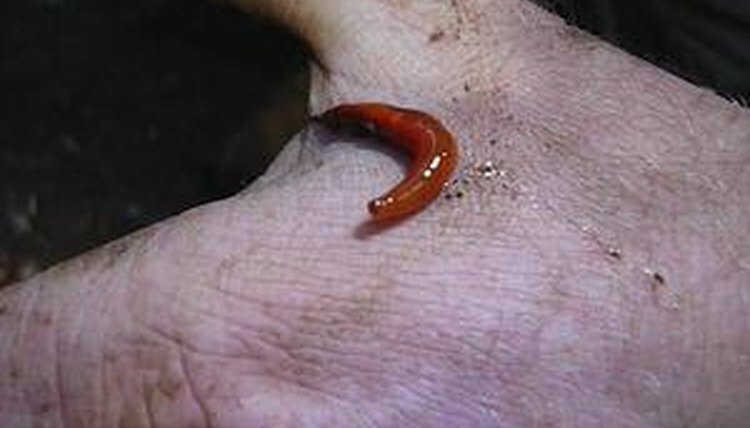 Like all members of the family Allenida, or “ringed worm,” leeches have cylindrical bodies. They have no bones. Before feeding, the body becomes flattened. This enables the leech to better connect to the surface of the host organism from which it's about to feed. Once fully fed, the body returns to its natural cylindrical shape. Aquatic leeches can adopt a flattened shape, even when fed, to swim better. When they do this, they resemble eels. The leech’s body is segmented. Hirudo medicinalis, the species used for medicinal purposes, has 33 or 34 body segments depending on the breed. These segments are marked by rings. All leeches have a posterior and anterior disc-shaped sucker. The anterior sucker on some leeches has teeth to make the incision for feeding. The suckers are also crucial for movement. The leech can move in a slow, wriggling fashion by alternately clamping and releasing its posterior and anterior suckers. Not all leeches are bloodsuckers. Some feed by engulfing their prey and swallowing it whole. To kill their prey, these leeches use a proboscis that they retract into their mouth when not in use. Leeches have 10 eyes, arranged in five pairs close to the anterior sucker. But they have poor eyesight. Leeches use their eyes primarily to detect changes in ambient light. If a shadow appears above them, they quickly detect it. This shadow reflex has two uses for the leech. If the leech detects a threat, it slows down its ventilation to become undetectable to the predator. If it detects a potential source of food, it hunts it.